Welcome back to January 10th of What I Ate! I really liked my ideas of doing collages from my last post to show more of the process of cooking, so I am carrying that on to today! 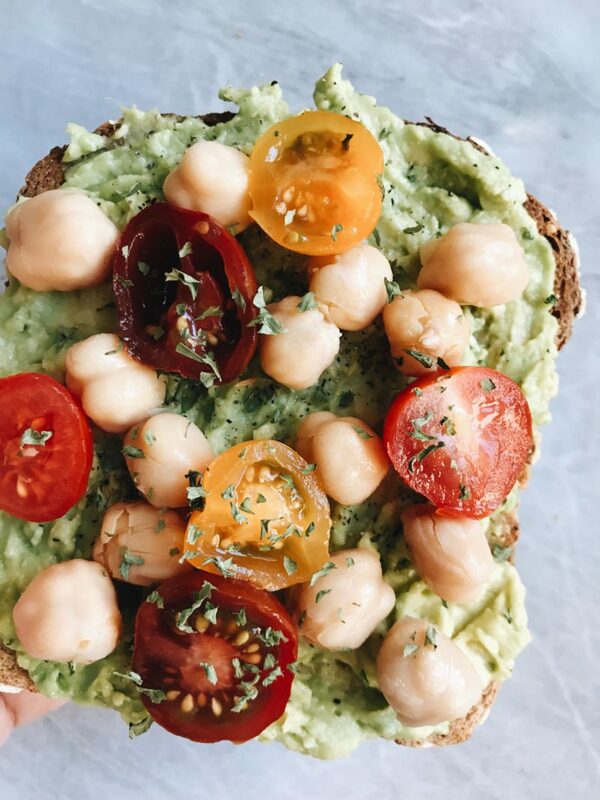 For breakfast this morning, I had avocado toast on Ezekiel bread with tomato & chickpeas! It it such a filling combo! For lunch I made another one of my veggie individual soup bowls! No real measurements for the veggies but I used onion, carrot, celery & cauliflower. I also used around 1/3 cup dry pasta but I recommend doing 1/4 if you want it to be more soupy. I added the onion, carrot & celery to a pot and sautéed it in a little olive oil for 2-3 minutes. I added 2 gloves of crushed garlic then cooked it for a little longer. Then I added my cauliflower and mixed for another 2 minutes. After, I poured in one cup of vegetable broth, around 1/4 cup passata & 1/4 cup water. I let that come to a boil and added in my pasta. I cooked it until the pasta was cooked (around 9-10 minute) and finished it off with nutritional yeast dried parsley & a squeeze of fresh lemon juice. I also had some leftover lentils (like not even 2 tablespoons) that I added to the soup for extra protein. For dinner I made roasted veggies, faro & my bang bang tofu. 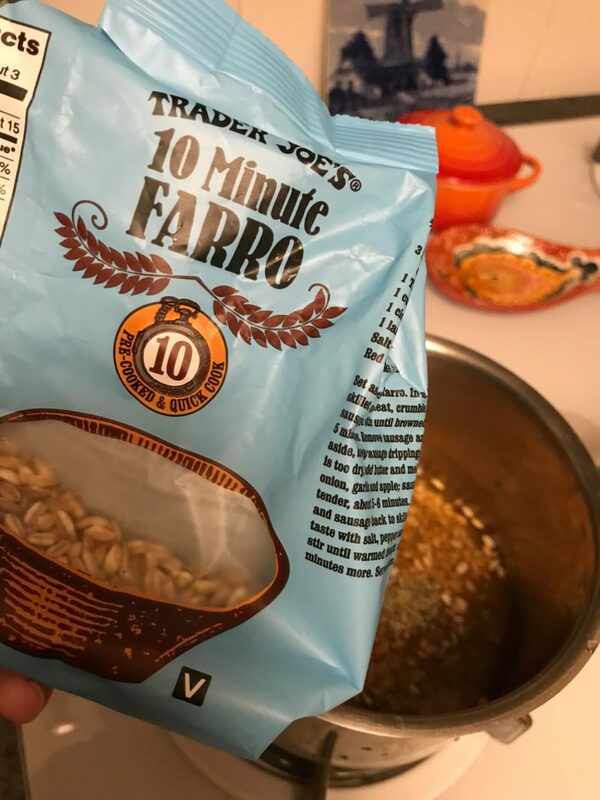 I like the Trader Joe’s farro. I combined 1/4 cup farro & 1/2 cup vegetable broth. I also used 1/8th teaspoon herbs de provence while cooking for extra flavor. Edit: I don’t recommend doing this because herbs de provence contains lavender and it literally tasted like tea lol! It was still super delicious but the lavender flavor was super strong! I literally FORGOT TO TAKE A PHOTO of the final project! Just imagine the same dinner from yesterday minus the potatoes & cauliflower. Add broccoli & the farro and instead of the buffalo tofu it was my bang bang tofu. Check out the recipe for the bang bang tofu here. It was honestly an amazing dinner and I highly recommend trying out farro if you haven’t yet! 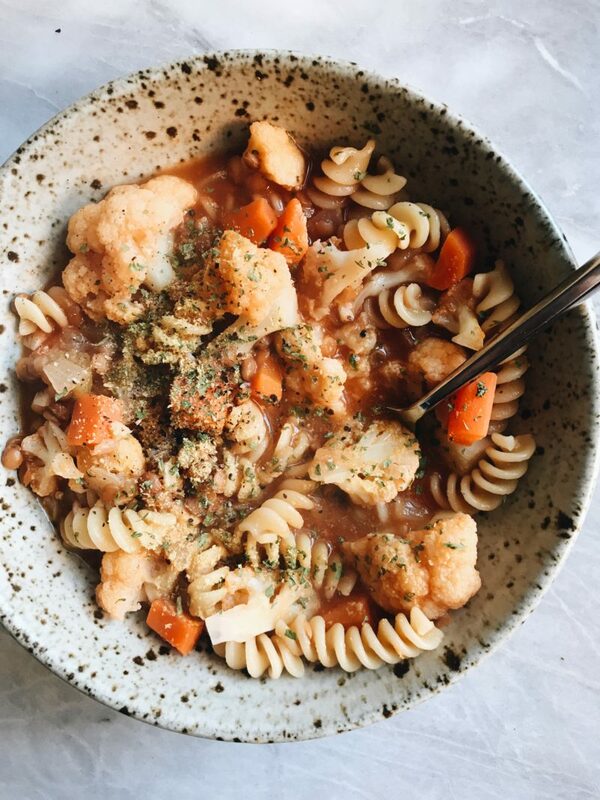 I love to cook mine in veggie broth as it adds the best flavor!